Enchanted Rock The second largest granite batholith in the United States sits square in the middle of the Texas Hill Country amidst miles of trails. Buescher State Park Nearby Bastrop State Park may get more visitors, but Buescher has its own path through the lost pines. Wild Basin This jewel in a rapidly developing area of Austin provides a hiking respite just a stone's throw from a major roadway. Red Bud Isle This short trail around an island in the middle of Lady Bird Lake is an ideal place to bring your dog. Who says you have to travel far from home to go on a great hike? 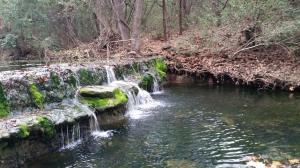 In Best Hikes Near Austin/San Antonio author Kieth Stelter details the best hikes within an hour's drive of the graeter Austin/San Antonio area perfect for the urban and suburbanite hard-pressed to find great outdoor activites close to home. Each featured hike includes detailed hike specs, a brief hike description, trailhead location, directional cues, and a detailed map.